This is a most welcome variation of the delicious strawberry shortcake. As they say, chocolate makes everything extra delicious and decadent! Here is an easy dessert recipe for Chocolate Chip Strawberry Shortcake. Preheat oven to 400°F (205°C). Lightly grease baking sheets with cooking spray. In a large mixing bowl, combine flour, sugar, baking powder, baking soda and salt. Incorporate butter using pastry cutter or two knives until mixture resembles coarse crumbs. Add in the chocolate chips. Stir in buttermilk with a fork just until moistened. Knead 2 or 3 times on floured surface. Pat to 3/4-inch thickness. Cut into 2 1/2 x 2 1/2-inch diamonds; place on prepared baking sheets. Bake for 12 to 14 minutes or until lightly browned. Remove to wire racks to cool completely. Cut one shortcake in half horizontally. 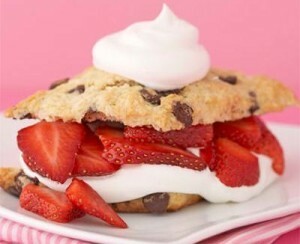 Spread bottom half with whipped cream; top with sliced strawberries. Cover with shortcake top; layer with more whipped cream and strawberries. Repeat with remaining shortcakes. Serve immediately.